Submitted by witness on Friday, December 11, 2015. OBSERVED: Location, Nashport, Ohio, Near Dillon State Park. 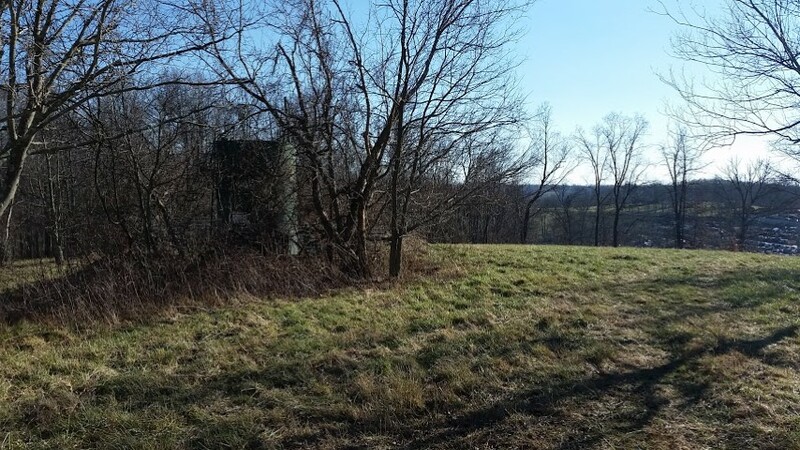 This is an account of events that transpired during mine and my friends 5 day hunting trip on a 40 acre tract in Nashport, Ohio, in Muskingum County. 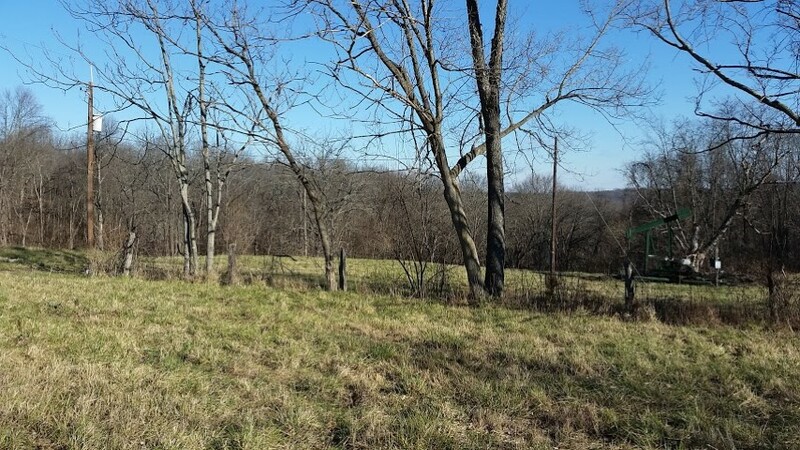 This land adjoins Dillon State Park, which is 2,285 acres of state ground. Both my friend and I are experienced woodsmen and hunters, in having been in nature our whole lives. We are confident in our knowledge of animals, their behavior, and calls. This compiling of events at times left us confused, awestruck and at a loss for words. We both went into the woods with the understanding that there are some things that cannot be explained or fully understood yet. However, we left our trip with a much greater understanding than we thought imaginable when planning this trip. Just after dusk. Light rain and no wind. We heard a large tree knocked over in the woods. There was no wind or outside influence that should have caused the tree to crash down. About 30-45 minutes later, we heard a second tree fall, which sounded larger. Around 8pm we began to hear tree knocks coming from 3 different locations simultaneously. The first 2 sounded like someone hitting 2x4’s together. The 3rd on the other hand was much louder. It sounded like someone hit the tree with a very large Louisville Slugger. Around 10pm, we heard what sounded like someone walking through the woods whistling. It was a human-like whistle, but we were the only people around. At about 3am, my friend stepped out of the camper to use the bathroom. Upon walking outside, he heard another loud tree knock from the 3rd location as before. We hunted all day and returned to camp. After dark, the tree knocks began. This time it was only 2 locations. Around 10 to 10:30pm we began to hear whooping sounds coming off of a ridge about a ¼ of a mile away. Still inside the camper, the sounds were so loud we could feel them. The whoops lasted 15-20 seconds without pause. Within 5 minutes we heard the call again, but this time the duration of the call was shorter. We stepped outside of the camper to get a better sound quality and then heard a 3rd set of whoops, this time so loud the calls could be felt in your chest. When these calls were finally finished the woods and entire area around us went quiet. Not a sound. Just as the night before we continued to hear wood knocks. Also noted we could hear something banging/ beating on cars in the junkyard below our camp site. At times it was so loud whatever this was seemed to be upset and trying to rip off a car door. The junkyard is inaccessible at night. Just as the night before my friend awoke around 3am to use the bathroom and upon stepping out of the camper was confronted with a very loud knock from the same area as the night before. The evening was quiet until about 9-9:30pm. Out of the blue, we heard a very long, very deep, aggressive almost tarzan like yell coming from the same ridge as the whoops the night before. This brought a chill down our spines it was so loud. It was long and powerful and lasted a solid 20 seconds. Trees knocks continued from the same areas as previous nights almost like we were being observed all evening. They were lesser in frequency on this evening however. About an hour later we began to hear coyotes yipping near the same ridge as all the calls have been coming from. There was an answer to the coyotes, which was similar but definitely not a coyote. The tone and pitch were different and it was much louder. It was very bone chilling to say the least. Shortly after this we could hear growling sounding like it was coming from just outside the camper. We loaded our guns and prepared for an encounter with whatever was out there. We stepped out with a bright flashlight but we could not spot anything. The tree knocks continued until we went to bed. Sitting around the fire around 9pm, we heard another tarzan yell, this time it was on a further ridge. Guessing around a ½ to ¾ of a mile away. It was long and as loud of a call as the evening before, just further off in the distance. It was quiet again until about 9:45. From the lake and waterway about a ¼ to ½ mile away, we heard a blood curdling high pitched scream. Also by the water way is a long set of rail road tracks that I wanted to note of here. From this point on we heard screams every 5 seconds. The screams progressively came closer and closer, moving down the creek bottom between the two large ridges. In no more than 30-60 seconds, the screaming had moved from the waterway again about a ¼ to ½ a mile away to what sounded like 100 to 150 yards away at the tree line. About 10 to 15 seconds later we heard what sounded like someone or something jumping on the hood of a car and over the 8ft tall (give or take) junkyard fence, clipping it as it went over. This was astonishing because in this 10 to 15 seconds of time this thing moved through 400 yards of heavy cover. I do not know of any person or animal that could do this that would also be responsible for these noises. A few minutes after all of this commotion, we heard the same blood curdling screams coming off the ridge behind us as all of the screams as the nights before. We set up a two man deer drive for the morning down the same ridges and holler from where the screams the night before were moving through. Moving as quickly as possible, it still took me an hour to cover and navigate the same ground as the high pitched screaming the night before. We decided to check out the area around the waterway for tracks to try and confirm what we thought we had been hearing throughout the week. At one end of the spillway, the water had receded to depths of only about 4 inches. There were nearly 20 tracks coming from the main ravine and rail road tracks and into the shallow end of the spillway. They all enter at the same place but veer off in 3 different directions. The tracks appeared to be 14-16 inches in length, 3-4 inches at the heel and 6 to 8 inches at the toe. 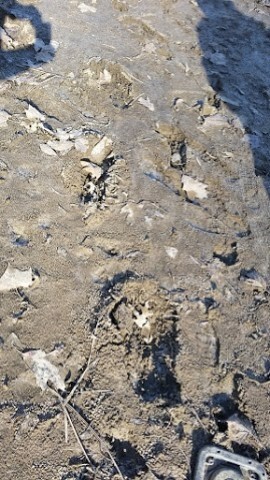 This creature appeared to have a stride of nearly or about 5ft toe to toe. My friend documented these as pictures on his cell phone. Upon further investigation we found more tracks 20-30 yards away in the sand on the bank. We took pictures of these as well. One set was slightly smaller but when up next to my 11 ½ size hunting boot it dwarfed my feet in comparison. We found another, larger track near these. 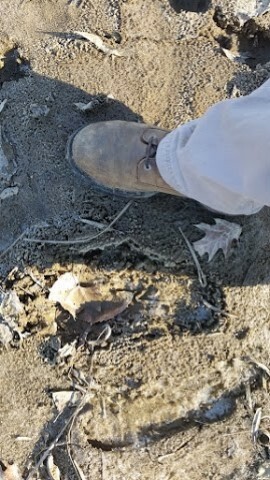 This footprint was 16-18 inches long at least 4 inches at the heel and 8 inches or more at the toes. It was an older track but still stood out to us. 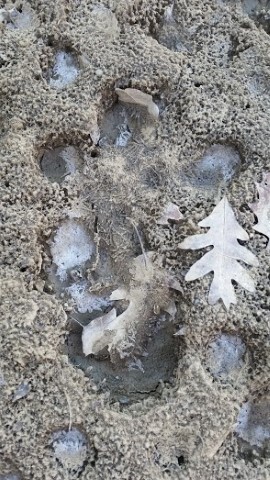 We have a clear picture of this track up against my friends size 13 hunting boot and this track just swallowed it. These impressions sunk deeper than anything my friend or myself could recreate, and we are not small men at 210 and 185 lbs respectively. Investigating the bank line we could see multiple shellfish that had been eaten (potential secondary food source to all of the gut piles and wounded deer from gun season) There were no other animal tracks in the area that would have been known to be feeding on these aka raccoons. Also noted we noticed multiple footprints that looked to be from a child barefoot. These looked fresh. Why someone would let their child run around barefoot in December in cold water and mud is beyond me? Still not sure what to make of this. Upon returning home I spoke to my girlfriend about what had gone on during our hunting trip and finding the tracks and she was mind blown and interested. Since the tracks were on public land and deer gun season was over I know it would be safe to take her down to the water and show her the tracks and let her see the area. First I took her down to a sand bar to show her an angle I had at a nice deer on Wednesday. When we got down there she said wow bigfoot. When we looked down there was a fresh set of tracks in the 14-16 inch range very similar to the other ones noted already. They were so fresh you could see where the mud had squished up between its toes. She took pictures on her phone with her feet next to them as reference. I then took her over to the sandy bank and showed her the tracks my friend and I had found to get a second set of pictures. Upon getting over there we found another type of track. It was roughly 14 inches in length but appeared to have severe hammer toe and or arthritis. It was roughly 4 inches at the heel and roughly 8 inches at the toes. We took pictures of this track as well. When exploring near the wood line I noticed how a very large creature had been moving through there. I found a large impression in the leaves. I began to remove them to get a better look at what was below. We found what appears to be very very large footprints. These were between 20 and 24 inches in length, well over 5 inches at the heel, and 10 to 12 inches at the toe. A picture was also taken of this impression. Upon seeing these the feeling of being watched began to overwhelm my girlfriend and we quietly left the area. At the end of this trip we left with some astounding experiences and a sense of shock. However, we both feel this is not a series of coincidences or random actions. Given our encounters and physical evidence which we were able to document, we strongly feel there is one explanation Bigfoot. Being experienced trackers, we feel these creatures are using the railroad tracks as a highway to come and go with minimal trace. 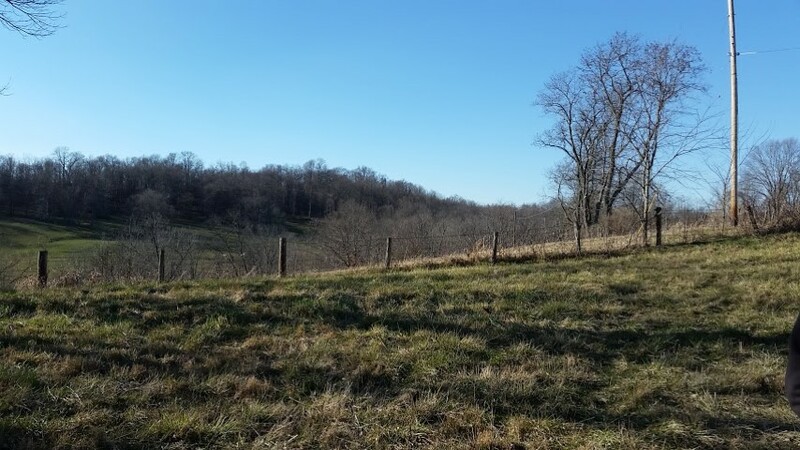 Our interactions this week led two outdoorsmen who are very comfortable in uninhabited woods to sleep with loaded guns within arm’s reach. Each of us there will think twice before staying or wondering near or in nearly untouched woods at night alone. Although we did not get a visual, we fully believe this creature is large, athletic and completely in its element in the woods at dark. ALSO NOTICED: We have pictures to coincide with prints left in the creek bottom. Met with the two witnesses on Saturday, December 19th at approximately 1 pm, both appearing trustworthy and honest. Very believable in relaying their observations through their week of hunting. 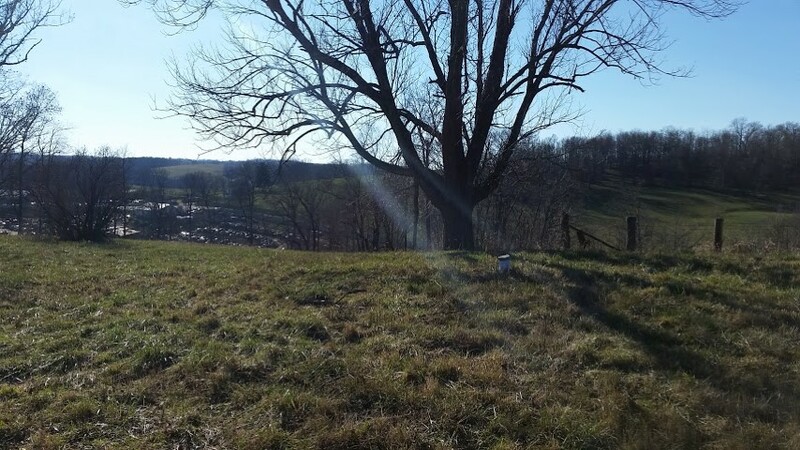 We met at the intersection of Pleasant Valley Church Road and Pleasant Valley Cemetery Road. There is an abandoned church and another building along with a parking area so that people can walk down to the water. We then proceeded to walk down to the water. 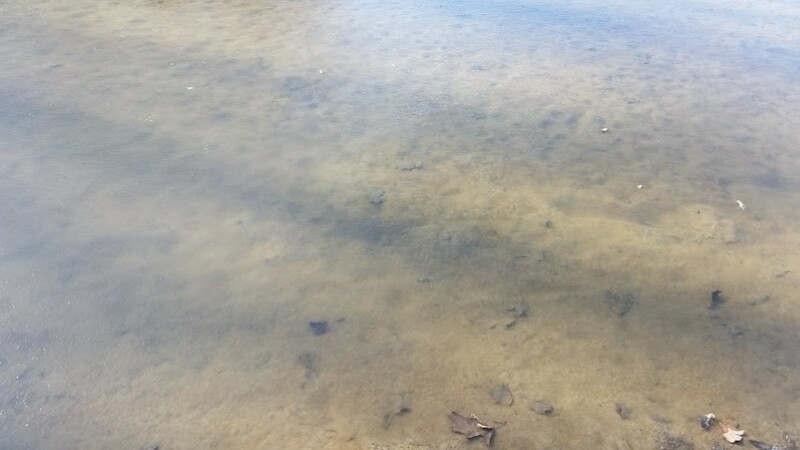 It was a dry sand bar due to the lake being lowered for the winter. The second trackway was on the other side of the inlet. 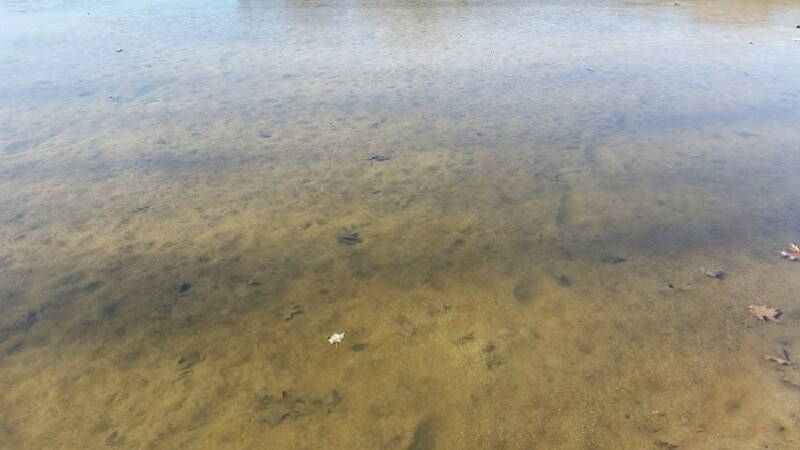 I saw several foot shaped tracks that walked out into the water and then another set came back towards the shore. There was ice on the water so the tracks could only be viewed for a short distance. From talking with the witnesses for almost two hours on a cold day in December, I do not believe they would waste their time or mine for a hoax, and their stories never changed. Dillon State Park is in an area of the state that has diverse and unique natural features. One of which is the Black Hand Sandstone. Sand, eroded hundreds of millions of years ago from mountains farther east, accumulated in a vast delta in the sea covering the region. This hard bedrock erodes to form sheer cliffs and supports a hardwood forest. The farmland and waters of the Dillon area help support the wildlife including white-tailed deer. Brad Kennan is a degreed Mechanical Engineer from The Ohio State University that currently owns multiple pre-owned automotive dealerships and has been investigating Bigfoot for 10+ years.